For me there was a strong wish with this house to produce a design that would demonstrate that achieving the passive house standard was not an impediment to good architecture. Two years ago, at the Better Building conference in Dublin, one of Ireland’s leading educators of young architects argued that great architecture should be exempt from energy efficiency regulations, because having to comply would excessively interfere with the expression of his architecture. It is tragic to think that a great architect believes he cannot accommodate robust detailing within his artistic objective. We can only counteract this attitude by proving it wrong. 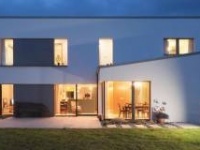 I think it is incumbent on clients and designers of passive houses to ensure that only the highest standard of design is achieved in passive buildings. 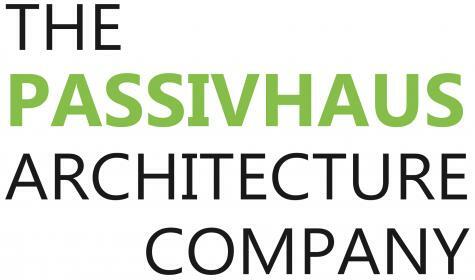 A passive house certificate is not a substitute for good architecture. Sustainable buildings which are aesthetically poor create an example to be used by those who are not inclined to produce low-energy buildings, and want an excuse. Therefore high performance buildings must also be beautiful. It’s interesting to take a look back at the story of this passive house from our current perspective. It’s safe to say that we are in a very different place in mid 2014 economically, to where we were when this house was being built in 2009 and 2010. At that stage, the wheels had just fallen off the wagon in the Irish construction sector. It was a frightening time to procure a building. For those of us young enough for it to be our first recession, it brought new challenges that we had never experienced before. This project was completed in late 2010 and early 2011, and as I reacquaint myself with the project file for the purpose of researching this article, I see that most of the companies and personalities involved are no longer in business. Some got into difficulty during this project, and others have wound up since its completion. 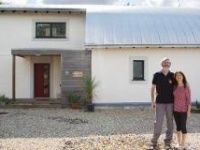 Fiona Nolan, the client and owner of this house, is one of the members of the eco-village at Cloughjordan, Co Tipperary. I met Fiona at the Cultivate sustainability centre in Dublin in 2007, where she attended a planning day for the eco-village members. At the time, I was considering becoming a member myself, and had started attending some events to get a feel for what was being planned. I also took the opportunity to set up a stall at the event describing my professional services. From that event, I was lucky enough to pick up three clients in the eco-village for whom I would go on to design homes. Fiona’s is the only one constructed to date, as changing circumstances in those turbulent times prevented the others from going ahead. Fiona was fortunate enough to be able to proceed. Since setting up my practice in 2004, I have always appreciated the passive house approach to construction, and initially strived unsuccessfully through bad luck and inexperience to take early potentially passive projects to completion. There are many interpretations of what kind of building is most appropriate for addressing the environmental issues facing us. Some people choose to place emphasis on the sourcing of materials, on breathability, natural ventilation, recycled components, local materials and avoiding certain substances, etc. The eco-village has a charter which obliges all members to address these issues and more. I was fortunate enough to find in Fiona a client who had the intention and means to get this project over the line. Fiona and I agreed that energy efficiency was a primary concern and so the brief from day one was to aim for passive house certification if possible, in excess of the standard required in the charter. While the house has not been certified, it can be when the client chooses to, as it has met all the requirements. The architect Louis Sullivan famously asserted that ‘form follows function’. The design for this project emerged from a direct response to the site. I think tight, difficult sites, are actually the easiest to design for, because the difficulties force a pragmatic response. My worst nightmare is to have to design a building for a greenfield, blank canvas site. The literally endless possibilities would make it very tough to decide which way to go. In this case, the requirement to provide southern aspect glazing for heat gain potentially conflicted with the entrance approach, meaning privacy would be an issue. I resolved this by introducing a diagonal screen wall and hiding the living spaces behind it. The curve in plan draws the visitor towards the front door, away from the large window behind the screen wall. The rest of the plan is generated by the very efficient planning device of creating a central stairwell and circulation space about which all the rooms revolve. The logic of the plan allows the living, dining and kitchen space to enjoy the west aspect, which means evening light and sunsets can be appreciated from here and the master bedroom upstairs, which has an indented balcony. Incredible attention was paid to giving what appears to be a relatively simple elevation an intrinsic harmony. The principles of the golden section, and the harmonic system of proportion, were used to underpin the setting out and dimensions of the facade. The dotted lines (‘traces régulataire’ as Le Corbúsier called them) in the elevation show where the golden section or square proportion was used to establish order. The airtightness layer is the OSB board which has been taped and sealed with mainly Pro Clima tapes. A Solitex membrane was used to give continuity between ground and first floors by wrapping around the first floor cassette. The construction system used was closed-panel timber frame manufactured by sub-contractor A-Frame in Co Meath. This means the walls were insulated in the factory, with Thermo Hemp, a method which gives greater quality control than site-insulated open-panel systems. The insulation is protected from the risk of getting wet also. The wall cassettes were then clad on-site with Gutex wood fibre insulation externally, which eliminates thermal bridges, and an internal service cavity was further insulated. External render was applied to a vented Aquapanel rainscreen. The roof and balcony construction were similar, with a vented air layer under the waterproof layer again offering a very robust way of dealing with moisture in the construction, which was breathable. The eco-village has a district heating system, fired by a communal wood chip boiler and backed up with a solar array. The district heating is not working at its optimum yet, as it is designed for the full build-out of the development, which is perhaps just over half occupied at the moment. The system supplies a large thermal store buffer tank in the plant room once or twice a day, from which a heat exchanger draws heat and tops up the heat recovery ventilation system. On top of the standing charge, the client has reported around €100 per annum heating costs. 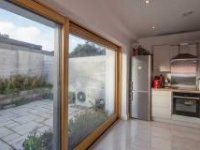 At the 2013 NZEB (nearly zero energy building) Open Doors event, Fiona noted the house does not overheat, despite omission of the solar shading as a cost-saving measure, and maintains comfortable temperatures without a backup heating system. There are no radiators, although we plumbed a heating circuit in just in case. There was originally intended to be a stove in the living room which was also omitted. I have learned from this and subsequent passive projects to be confident about what you leave out. If your heat load is telling you that you don’t need a back-up heating system or central heating, don’t put one in. A word of warning is that while on this project the OSB airtightness layer worked, it hasn’t for some other practitioners, so I would recommend you use the new products on the market which give guaranteed results. We have also found that on completion, some clients have found it difficult to obtain competitive house insurance for ‘non-standard construction’. Mainstream insurers often deem ‘standard’ to mean pre- 2011 building regulations 100mm cavity construction. This may have changed since the completion of this building, but at the time the client struggled to get quotes and eventually I was fortunate enough to discover Arachas insurance brokers who obtained cover through Hiscox. This is a project which meets the passive house standard and boasts other significant environmental benefits, not just in terms of construction, but location, community and hopefully you will agree, in terms of architectural merit. After ten years of private practice, Paul McNallyhas announced the launch of a new venture inthe field of passive house architectural services.A new architectural practice, The PassivHausArchitecture Company, is now providing serviceswith a particular focus on the commercial sector.This follows on from the recent completion of Paul’s passive house pharmacy and apartment -project in Clonmel, Co Tipperary which will be the subjectof a future article in Passive House Plus. 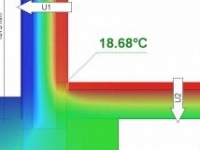 Thermal bridging: Thermal bridges were eliminated in the detailing but default values were used in DEAP and PHPP. Heating system: District heating system supplied by wood pellet power station and communal solar array. Supplies domestic hot water and water to air heat exchanger to ventilation system. Ventilation: Paul Atmos 175DC heat recovery ventilation system. Passive House Institute certified to have a heat recovery rate of 88%. Green materials: Fermacell dry lining board, hemp insulation, Auro natural paint, 50% GGBS cement, LED lighting, EPDM roof membrane, Gutex wood fibre insulation, cement rainscreen rather than blockwork, Marmoleum and timber floors.